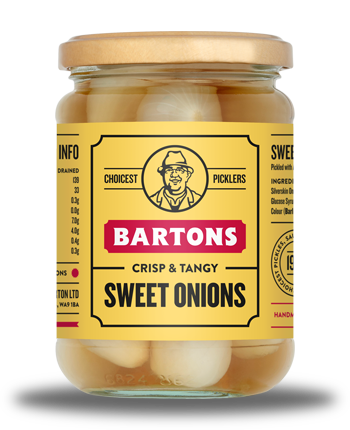 Bartons Sweet Onions in Vinegar is a pickle preserved with vinegar and salt. Eaten alongside Traditional English Fish and Chips or as part of a Pub ploughman’s lunch. Bartons Sweet Onions in Vinegar is a pickle preserved with vinegar and salt. Eaten alongside Traditional English Fish and Chips or as part of a Pub ploughman’s lunch. These small white pickled onions are known as ‘silverskin’ onions, frequently used as an essential component of a salad or can be served on sticks and known as the ‘Party Onion’. They are also available in unsweetened vinegar. For those who need more than a jar, we also have catering sizes. Silverskin Onions, Water, Vinegar, Sugar, Salt, Malted Barley Extract.